Despite losing her parliamentary seat in 1997, Edwina Currie is probably still one of the few female politicians the man or woman in the street could name. In the years since retiring from active politics she has carved out new roles for herself as a radio presenter, novelist, and all-round media personality. She even let the camera crews into her private life by taking part in a famous Celebrity Wife Swap, where she ended up living with horse racing ?character? John McCririck. But no matter how well the general public thinks it knows public figures, they always have some aspects to their lives that remain less celebrated, and for Currie that aspect is her bike. In the last 10 years she has cycled through deserts, along the Nile, from London to Amsterdam, and across any number of European countries. Not only does she ? along with husband and retired Met police officer John Jones ? 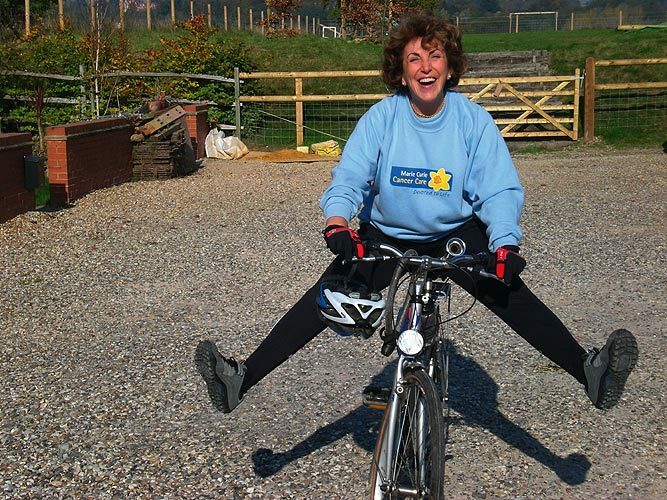 ride all year round, she also takes a particularly involved role when it comes to promoting Marie Curie Cancer Care?s fund-raising cycle events. And there?s a good reason why she is especially enthusiastic about Marie Curie?s charity rides: she helped start them. We chatted to her as she planned for Marie Curie?s next big excursion in September 2008: covering 2,000 kilometres across former Eastern bloc countries to St Petersburg. CW: How did you originally get involved with these rides? EC: We have always supported Marie Curie Cancer Care for all sorts of reasons ? one of which is that John?s first wife, Frances, died in a Marie Curie hospice. So we had been doing all these rides for charities but we?d been getting a bit frustrated because the charity we really wanted to raise money for was Marie Curie, but they didn?t do one. So eventually we introduced Classic Tours, who organise a lot of these long-distance events for charities, to the Marie Curie cancer charity. We said, you two should be talking together, you should be organising a long distance bike ride to raise lots and lots of money. And I said, and because Marie Curie was Polish you should be doing it in Poland ? it?s good cycling country, it?s mostly flat! And I?ve been teased about that ever since! EC: The first one was in September 2004 and we rode from Krakow in the south of Poland to Marie Curie?s birthplace in Warsaw. It was just fabulous, it was a lovely ride. We were in the foothills of the Tatra mountains, so although the first few days were hilly you were going down more than you were going up. And then the last couple of days were pretty flat. It wasn?t absolutely flat like Holland, it was gentle undulations, so it was great cycling territory. You put in a little bit of effort to get up the climbs then you have a mile or so of whizzing downhill: that?s my kind of cycling, I?ll tell you. And that one ride raised a quarter of a million pounds. EC: On that first ride in 2004 we were met in Warsaw by the British ambassador to Poland, who said: ?I?ve got an idea. If you can do one leg into Warsaw like that, why don?t you do four or five and raise £1 million?? And that then came to be the Great 500 which we ran in 2006. We had cyclists starting in five different cities: Berlin, Prague, Krakow, Gdansk and from Vilnius. We didn?t exactly race, but there was a bit of a question about who would reach Warsaw first, although we would all arrive there on the same day. John and I went in the Vilnius group; it was a five-day ride through the absolutely beautiful Polish lake district. EC: Well, we woke up early on the final Friday morning and got ourselves into Warsaw all in one piece, 80 of us, and the Berlin lot arrived about 10 minutes later, seriously cheesed off because they?d woken up at five o?clock in the morning to beat us and they hadn?t, and they had been riding hard for six long days with lorries up their backsides! The Gdansk crowd had 12 ladies who had been recruited through a weight-watching magazine, and who were very large, and who spent most of each day on the bus. The Prague lot came over the mountains, so they were all serious cyclists and had a fantastic time. And the Krakow gang had a terrific ride and really enjoyed themselves. We raised, all together, about £1.5 million. So that was absolutely awesome. ?You put in a little bit of effort to get up the climbs then you have a mile or so of whizzing downhill ? that?s my kind of cycling? EC: It takes about a year to organise these sorts of things. So the Great 500 was in 2006 and the next event is in hand for 2008, which will be the 60th anniversary of both the NHS and the Marie Curie Cancer Care charity. The 2008 event is called Bike the Baltic. This time instead of doing it all at one time ? which caused all sorts of logistical problems, like just how many rideable bicycles can you hire in Central Europe? And the answer is, slightly fewer than we had! ? this time we?re going to start in Warsaw and we?re going to finish in St Petersburg. That?s 2,000 kilometres and the whole ride will take four weeks, and it will be split into four parts. We?ve got some people signed up to do the whole lot. We?ve got one couple whose combined age is 138, who are going to do it on a tandem. So you guys when you do your time trials ? you think you?re achieving something? Believe me, you haven?t even started! How do you intend to split the ride up? EC: The idea will be that the group on the first leg will go from Warsaw to near Vilnius in Lithuania. Then the next leg will go from Lithuania through to Riga in Latvia. The third leg will go from Riga to Tallinn in the Baltic. And the last lot, which I have signed up for, will go from Tallinn to St Petersburg. I chose that partly because it?s the last leg so it looks like fun, and partly because it?s also the shortest leg! But that will still be tough. EC: I think along the Baltic coast it should be flat but, like in Holland, sometimes that means you have to pedal for every inch of the way. My preference is always for slightly undulating countryside, and twists and turns, with a little bit of forest here, a lake there, and a few herons flying overhead. That?s very enjoyable. But this could be quite a tough one. But anybody who signs up for this will have the most amazing experience. The finish in St Petersburg should be pretty spectacular. What we want now is for people to sign up. Obviously they have got to be bike fit because there can be long days in the saddle ? but if you?re used to long-distance cycling it should be a doddle, and there?s no experience quite like it. For more information about Marie Curie Cancer Care?s upcoming cycle challenges, and next year?s Bike the Baltic, visit www.mariecurie.org.uk/events.